Washington sources reported that Former US presidents Barack Obama and George W. Bush, once fierce rivals of the late Senator John McCain, praised him in eulogies and joined his daughter at a memorial service in subtle and not so subtle rebukes of President Donald Trump. 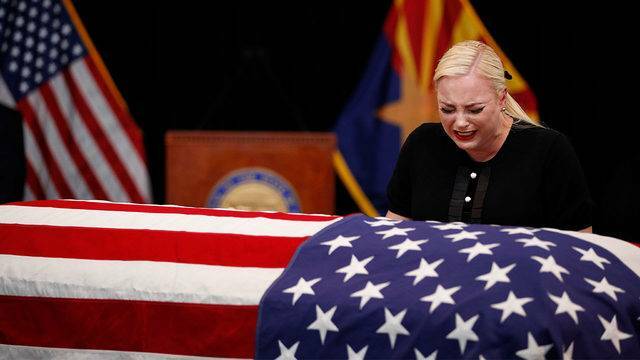 Meanwhile without naming Trump, who did not attend the service, Meghan McCain made a forceful statement condemning the president in remarks that at times drew applause and came after she said her dad told her to "show them how tough you are" with her eulogy. She said “We gather here to mourn the passing of American greatness, the real thing, not cheap rhetoric from men who will never come near the sacrifice he gave so willingly, nor the opportunistic appropriation of those who live lives of comfort and privilege while he suffered and served," and speaking forcefully and, at times, through tears. Furthermore when taking aim at Trump's campaign slogan, "Make America Great Again," she said McCain's America was always great. Moreover Trump feuded publicly with McCain and mocked his military service, continuing to knock him even after he grew ill. Furthermore Trump, also a Republican, spent Saturday tweeting on other subjects and went to one of his private golf clubs in Virginia. Previously Obama, who beat McCain in the 2008 US presidential election, hailed the one time prisoner of war for his commitment to truth and core democratic values, qualities that some critics see lacking in Trump, a former reality television star and New York City real estate mogul.